This is great on a cold winter day. It’s a light and brothy chili that will warm you up. Pat the chicken dry with paper towels and season with salt and pepper. Heat 1 tablespoon of the oil in a Dutch oven over medium-high heat until just smoking. Cook the chicken until golden brown on both sides, about 5 minutes, flipping halfway through. Transfer the chicken to a plate. Heat the remaining 1 tablespoon oil in the pot over medium heat until shimmering. Add the onion and 1/2 teaspoon salt and cook, stirring occasionally, until softened, 5 to 7 minutes. Stir in the garlic, cumin, oregano, and 1/2 teaspoon pepper and cook until fragrant, about 30 seconds. Stir in the broth, scraping up any browned bits. Return the chicken, along with any accumulated juices, to the pot. Bring to a simmer and cook until the thickest part of the breasts registers 160 to 165 degrees on an instant read thermometer, 10 to 15 minutes. Transfer the chicken to a plate. 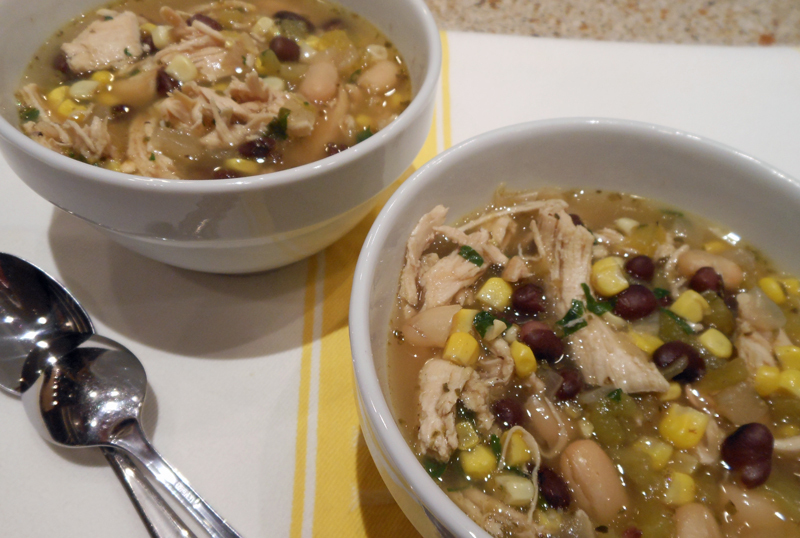 When the chicken is cool enough to handle, shred the meat into bite sized pieces and return it to the chili; add the beans, corn, and chiles. Return to a simmer, cover, and cook, stirring occasionally, until thickened, about 15 minutes. Off the heat, stir in the cilantro and season with salt and pepper to taste. Dixie, did you send out a recipe with fresh green beans, maple syrup, bacon and dried cranberries? Could you please send it again? I got a scramble of 2 pp. Thanks, Judy R.